Free-range, cage-free, all natural … what does it all mean, and how do these claims impact animal welfare? To the average consumer, these terms can be confusing, overwhelming and, at times, misleading. That’s why we’ve compiled some of the most common food labels and what they really mean for farm animals so you’ll always be armed with the facts when you shop. Always on the run? Download our food label pocket guide for on-the-go reference [PDF/JPG]. Español [PDF/JPG]. 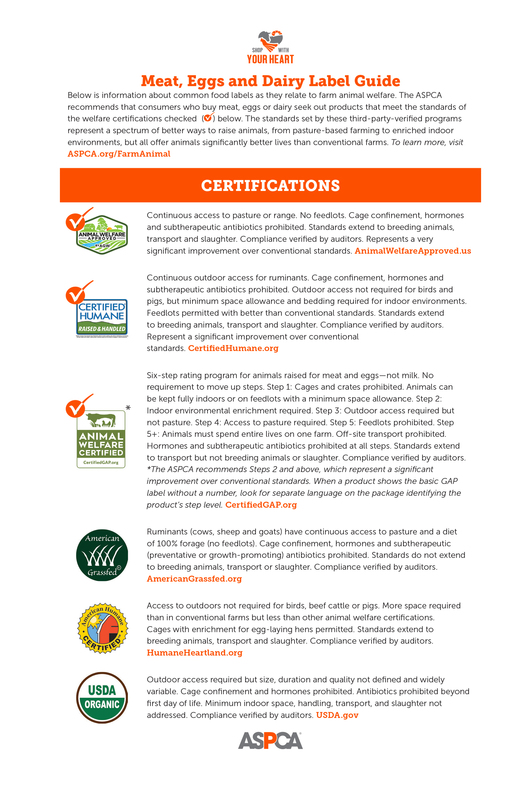 The ASPCA recommends that those who eat meat, eggs or dairy seek out products bearing the logo of one of the checked ( ) certifications below. These third-party-verified programs represent a spectrum of better ways to raise animals, from pasture-based farming to enriched indoor environments, but all offer animals significantly better lives than conventional farms. We encourage consumers to read about the programs’ standards on their websites and to sign up to Shop With Your Heart in whatever ways you can. Continuous access to pasture or range. No feedlots. Cage confinement, hormones and subtherapeutic (preventative or growth-promoting) antibiotics prohibited. Standards extend to breeding animals, transport and slaughter. Compliance verified by auditors. Represents a very significant improvement over conventional standards. Continuous outdoor access for ruminants. Outdoor access not required for birds and pigs, unless the words “free range” or “pasture” also appear on the package, in which case the farm is adhering to defined outdoor standards. If indoors, adequate space, bedding and enrichment are required for pigs and birds. Cage confinement, hormones and subtherapeutic antibiotics prohibited. 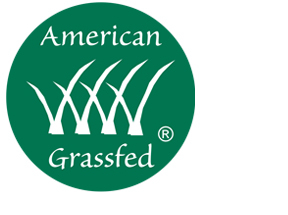 Feedlots permitted for limited periods, with better-than-conventional standards. Standards extend to breeding animals, transport and slaughter. Compliance verified by auditors. Represents a significant improvement over conventional standards. 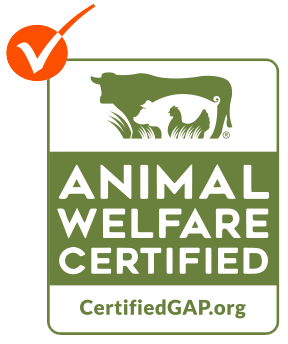 Six-step rating program for animals raised for meat and eggs—not milk. Each successive step represents progressively higher welfare and includes all requirements of those below it. No requirement to advance up step levels. Hormones and subtherapeutic antibiotics prohibited at all steps. Standards extend to transport, but not to breeding animals or slaughter. Compliance verified by auditors. Steps 2 and above represent a significant improvement over conventional standards. When a product shows the basic GAP label without a number, look for separate language on the package identifying the product’s step level. Step 1 Cages and crates prohibited. Animals can be kept fully indoors or on feedlots with a minimum space allowance. *Step 2 Indoor environmental enrichment required. *Step 3 Outdoor access required but not pasture. *Step 4 Access to pasture required. *Step 5+ Animals must spend entire lives on one farm. Off-site transport prohibited. 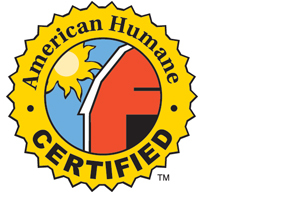 Not to be confused with Certified Humane. Access to outdoors not required for birds, beef cattle or pigs. 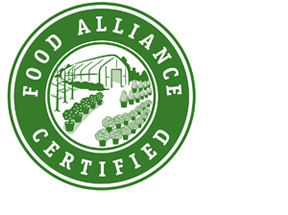 More space required than in conventional farms but less than other animal welfare certifications. Cages with enrichment for egg-laying hens permitted. Standards extend to breeding animals, transport and slaughter. Compliance verified by auditors. However, only 85% of the non-essential standards must be met to pass inspection. Ruminants (cattle, sheep and goats) have continuous access to pasture and a diet of 100% forage (no feedlots). Cage confinement, hormones and subtherapeutic antibiotics prohibited. Standards do not extend to breeding animals, transport or slaughter. Compliance verified by auditors. Outdoor access required but size, duration and quality not defined and widely variable. Cage confinement and hormones prohibited. Antibiotics prohibited beyond first day of life. Minimum indoor space, handling, transport, and slaughter not addressed. Compliance verified by auditors. Prohibits cages and crates and certain physical alterations. 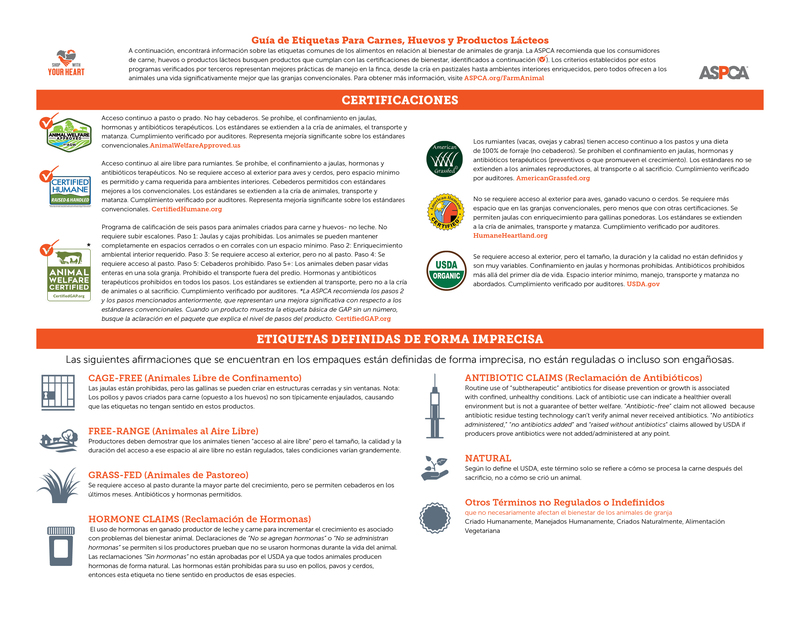 There are four levels of standards ranging from standard industry practices to higher welfare pasture systems, but no indication of level on the label. Compliance verified by auditors. However, only 75% of standards need to be met in order to pass the audit. 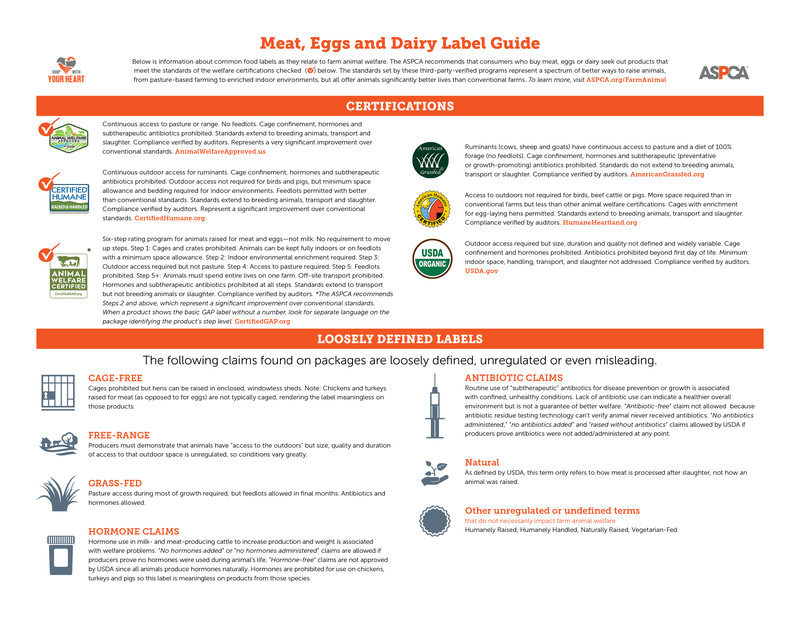 The terms below, which appear on meat, egg and dairy packages, can indicate better animal welfare but often lack clear standards, verification processes or independent oversight, allowing farm conditions to vary widely across producers. Routine use of subtherapeutic antibiotics for disease prevention or growth is associated with confined, unhealthy conditions. Restricting antibiotics to treatment purposes only can indicate a healthier overall environment but is not a guarantee of better welfare. “Antibiotic free” is not an approved claim because the USDA cannot verify that the product contains no antibiotic residue. “No antibiotics administered,” “no antibiotics added” and “raised without antibiotics” claims are allowed by the USDA if producers prove antibiotics were not added or administered at any point in the animal’s life. Unfortunately, antibiotic bans may lead producers to withhold valid treatment from sick animals. 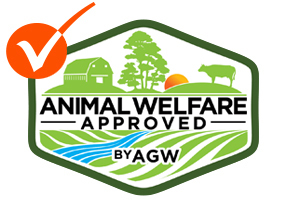 For products from farms using antibiotics in a way that protects both human health and animal well-being, look for one of the above welfare certifications with a .
Cages prohibited but hens can be raised in enclosed, windowless sheds. Note: Chickens and turkeys raised for meat (as opposed to for eggs) are not typically caged, rendering the label meaningless on those products. Producers must demonstrate that animals have “access to the outdoors” but size, quality and duration of access to that outdoor space is unregulated, so conditions vary greatly. Pasture access during most of growth required, but feedlots allowed in final months. Antibiotics and hormones allowed. Hormone use in milk- and meat-producing cattle to increase production and weight is associated with welfare problems. 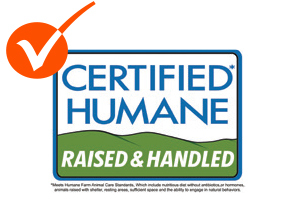 “No hormones added” or “no hormones administered” claims are allowed if producers prove no hormones were used during animal’s life. “Hormone-free” claims are not approved by USDA since all animals produce hormones naturally. Hormones are legally prohibited for use in chickens, turkeys and pigs so this label is essentially meaningless on products from those species. 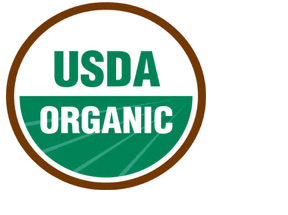 The USDA does not clearly define these terms. Therefore the terms offer no assurance about the animals’ welfare. The USDA does not clearly define this term, nor do they offer any assurances about the conditions in which animals are raised. While access to pasture is preferable to confined, indoor systems, the term is only loosely regulated by the USDA. These claims do not have a significant impact on animals’ living conditions. However, feeding ruminants large amounts of grain, as opposed to vegetation-based diet, can cause liver abscesses, stomach problems and lameness. Note: Many labels above allow certain physical alterations, such as castration, branding, beak cutting, tooth grinding or clipping, tail cutting and other procedures. Pain control is sometimes, but not always required. These practices, which can be painful, are usually done to reduce injuries from behavior resulting from over-crowded, stressful living conditions.